WASHINGTON (CNN) -- Concerns about the effects of toxins emitted from burning trash at military installations in Iraq and Afghanistan have members of Congress demanding more tests and research. 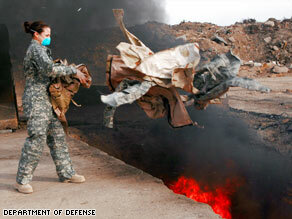 The U.S. military burns waste -- including medical waste -- in pits near an Air Force base in Iraq. The members of Congress want information from the military to see if there is statistical validity to complaints about illness and disease suffered by troops who served in those countries. The emissions, from what are known as "burn pits," have been a concern for troops, especially those who served at Balad Air Force Base in Iraq. Many of the soldiers who went through Balad since the beginning of the war became used to "Iraqi crud," as they dubbed the symptom of excessive coughing and black phlegm. Soldiers complained of respiratory problems and skin infections, and in some cases believe they developed leukemia and tumors from the exposure. The pits at Balad were at one point open and burning everything from plastics and food to medical waste. In later years, incinerators were installed at Balad, but many other bases in Iraq and Afghanistan still use the pits without incinerators to burn garbage. Various tests by the military concluded that emissions are not harmful. The military said smoke from the pit exposed troops to toxic emissions, including low levels of cancer-causing dioxins. But its tests indicate there is no long-term danger, officials said. "The data indicate that there are no substances above a health threshold that should generate any long-term health risks, including cancer," Craig Postlewaite of the force readiness and health assurance office at the Department of Defense said. At the Pentagon's Force Health Protection Directorate, officials analyzed more than 160 air samples and concluded, in a soon to be released report, that the only risk is of temporary respiratory distress, nothing that poses a long-term threat. But many -- including some members of Congress -- remain unconvinced. "After years of helping veterans of the Vietnam and Gulf wars cope with the health effects of toxic battlefields, we have learned that we must take exposures to toxins seriously to ensure that this generation of service members does not face the same difficulties," the congressmen say in the letter to be sent Monday to the Armed Forces Institute of Pathology. The letter, signed by six representatives including Rep. Tim Bishop, D-New York, asks for data from the military about tumor rates to see if a pattern of problems can be ascertained. CNN was given a copy of the letter in advance. "We are collecting this data in order to help better understand what is happening to our troops in Iraq and Afghanistan," the letter explains. "This would help to ensure specific benefits for service members who have been discharged from service if they become disabled because of certain diseases."